4 topics. 2 thoughts each. Like a 2x4 of design opinions upside ya head. Home Improvement was a staple of my 90’s childhood and inspiration for my design career. Jon and I are a lot like like the dynamic duo of Tim “The Toolman” Taylor and Al Borland from the 90’s TV show, Home Improvement: We often wear flannel and blue, one of us can grow a beard, we love dad jokes, and we each have different perspectives on our industry. We’ve written up two reactions to four recent topics in the design world (2x4, get it? It’s a construction reference!). I hope this inspires some of your own thoughts or even (respectful) dialog — we love to chat! 1. What does Airbnb’s React Sketch.app mean for design and automation? Corporate design teams are open-sourcing their design process. As design systems become more than just style guides and actually include code components and automations, you also get design teams’ process along with the style. It’s powerful and inspiring, but don’t feel insecure if it’s not a fit for you and your process. Designers and developers both seem to be automating the handoff process from both ends: Code that can automate design, and design that can automate code. I wonder when of these groups might one day say, “oh you automated that? I actually liked doing that!” Overall, technology is giving us the power to automate almost any part of our process. In design, we have to ensure we understand what we actually want to automate and what we truly enjoy doing. 2. Will I really switch to Figma? This article by Tom Johnson certainly makes a compelling case. Don’t get me wrong, UX Power Tools is all in on Sketch. But I’d be lying if I said I didn’t have “Try Figma” on my to-do list for a few months. Why? Design intelligence: I don’t personally care for the collaborative side of Figma, but they are doing some amazing things with components and responsiveness. 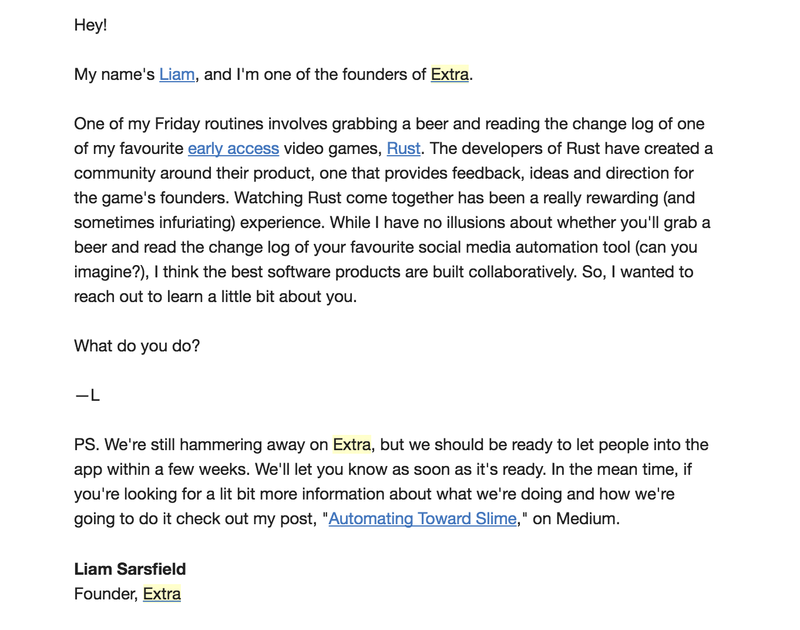 Extra.ai is something we pointed out on our Twitter account a few weeks ago because we loved their straightforward copy on the product marketing site. This is evident in Liam Sarsfield’s email campaign as well. Transparency. They are being transparent about their process as they head toward alpha. No dog and pony show here. This transparency motivated me to respond to this email, even though I typically ignore the first several marketing emails I get from new products. Education. They share personal philosophies on the industry through their content. There opinions aren’t polarizing, but they have a distinct point of view, and without even seeing the product, I feel smarter about social content. I won’t give you a convoluted diagram detailing all the different types of design, I promise. We recently showed off some ideas for instilling branding in your design, and while writing this, I reflected a lot on how I’ve personally made the transition from a trained interaction designer to product designer. Usability is irrelevant if nobody is using it. People will use a design that is marketed to them in way that compels them to buy. Adding marketability to your design means that when it’s demoed or shown on a product site, it can resonate with a potential buyer. Good product design utilizes brand to the UX designer’s advantage. We see design teams weaving in brand into the product in a way that extends the brand to be helpful to the user. It can be copy and voice like Slack, or distinct visuals like Stripe.com. In either case, the method isn’t just slapping on visuals to make something look polished. Instead, they extend the voice and aesthetic of the product into the everyday experience. That’s all for this month. One of us headed back to work and the other to Mexico for vacation. We’re happy to hear your thoughts on these topics as well. Otherwise it’s just us rambling into the Internet void (which we’re ok with).